Indiana University Health rounded out 2017 in a strong financial position, despite its operating income being weighed down earlier in the year by its divestiture of three hospitals. The Indianapolis-based academic health center managed to boost its operating income by 85% in the third quarter compared with the same time in 2016 to nearly $239 million. That's after posting a 46% operating decline in the second quarter following the divestiture of Goshen Health and La Porte and Starke hospitals. Operating revenue was up 9% in the fourth quarter to $1.7 billion. Expenses were up 2% during that time to $1.5 billion. Those fluctuations weren't as dramatic when viewed across the entire year, in which operating revenue grew only slightly to $6.3 billion and expenses were essentially flat. 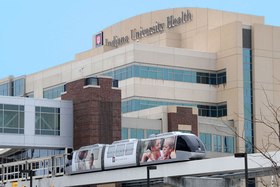 Strong investment gains helped IU Health nearly quadruple its excess of revenues over expenses to $989 million in 2017. "IU Health made substantial progress on its operational and cultural goals in 2017, even as we engaged a broader cross-section of the community through care, education and service," Dennis Murphy, IU Health's president and CEO, wrote in a statement. IU Health also bucked the widespread trend of lagging admissions last year. Admissions grew by 2.7% in the final quarter and 8.2% in the year. Inpatient days, surgeries and imaging services were also up. Emergency room visits were down 1.5% during the year, however. Despite the positive admissions trends, IU Health's net patient service revenue dropped by 2.2% in 2017, driven in part by decreased revenue from commercial insurers and increased revenue from a state-sponsored health insurance program for low-income adults. Premium revenue from the system's own health plan was also down. IU Health's work to standardize its supplies purchasing across all 15 hospitals and ambulatory facilities may be starting to show the results an executive described in a recent interview with Modern Healthcare. IU Health's spending on supplies, drugs and purchased services dipped by 2.2% in 2017. At the same time, spending in the larger category of salaries, wages and benefits increased by 2.6%, which the system said is primarily because of pay increases in the middle of the year and an increase in full time equivalent employees. IU Health recently closed on the sale of MDwise, a 360,000-member Medicaid health plan it jointly owned with Health and Hospital Corp. of Marion County. Next month, the system will officially bring on Jay County Hospital in Portland, Ind. Also this year it will launch a primary care office and pediatric specialty clinic in Fort Wayne, Ind.